The Eurotherm nanodac is a 4 channel recorder in a compact 1/4 DIN panel mounting size, with optional 2-loop control, advanced cascade control, programs and master comms over Ethernet. The Eurotherm nanodac has four high accuracy universal inputs for data recording and an additional 30 virtual channels can be utilised to provide maths, counter, values from remote instruments (optional) and totaliser functionality within the instrument.. This secure data recording device is enhanced by a full colour, 3.5", 320 x 240 pixel, display to bring a crystal clear operator interface to even the smallest of machines. The nanodac has multiple real-time views and historical review on the product, multiple data archiving strategies are provided utilising onboard Flash memory, removable USB and data transfer via FTP to a specified server. The four universal input channels provide high accuracy (suitable for use in Nadcap AMS 2750 applications) and 125ms parallel sampling. Review software for Windows can also be used to automatically retrieve data to a Review database over the Ethernet network connection. Both Review and Dream Report software can be used for report generation that meets the needs of your process. The nanodac can also provide two independent control loops (optional). This control functionality utilises the advanced Eurotherm PID algorithm providing high performance and reliability to your process. Functionality includes one of the best autotune facilities available along with overshoot inhibition (cutbacks); compensation for power fluctuations using power feedforward; linear, fan, oil and water cooling. The Advanced Control optional offers cascade control loops with easy setup and tuning and allows the operator to set up individual set point ranges and tune the cascade loop. nanodacs controllers can also have a Dual Programmer enabled, supporting up to 100 programs locally, each program supporting 25 segments. All nanodacs include Ethernet communications as standard and can act as a 'Slave' device, allowing compatible instruments to access their current values using Modbus protocol. They can optionally be a 'Master' device and access other compatible instruments and retrieve and record current values from them. *30 virtual channel and Modbus inputs require Comms Master option. Further options, including low voltage supply, other outputs, specialist application blocks and dual input channels, are also available, contact us for more details. Other models are also available within this range. 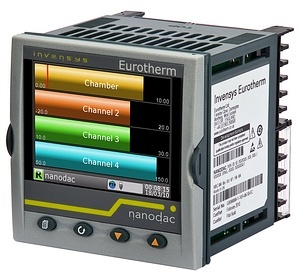 View more details of the Eurotherm nanodac 1/4 DIN Recorder / Controller range. Other models might not be available from stock, please contact us for price and lead time.